The book production department is responsible for the design, layout, printing, and/or e-book coding of the finished book. Here's how it happens. The book production process officially starts when the acquiring editor of the book submits a final, edited book manuscript to a copy editor. At that point, the manuscript is considered to be "in production" and the page layout and design process begins. Note that while the book is in production, the book jacket is being designed at about the same time. The copy editor reviews the final manuscript for grammar, spelling, and consistency. He or she corrects errors and questions anything that isn't clear in the text. The copyedited manuscript comes back to editor and author with queries from copy editor. The author and the editor answer the queries and consult to finalize the text. The manuscript now goes for design and layout. For books that don't have photography or illustration (sometimes called "art programs"), the author will likely not see the text again until the page proofs. In art-, photo- or illustration-heavy books (such as cookbooks or coffee table books or do-it-yourself instruction books), the author is often looped in during the page design process. While the pages are being copyedited and reviewed, an overall design direction is determined for the book by the creative team and editor. At this point in the process, the author receives sample pages. Once a design is finalized by the team, an entire "dummy" book is created and all parties review the page layouts to fit copy, to gauge the appropriateness of art-to-text, and to make changes as necessary. There may be more than one dummy book stage to be reviewed. The author receives the text laid out in page proofs (or the text and art in a dummy book, see above). At the same time, the page proofs are being reviewed by the editor, a proofreader and various members of the production staff. Typos are corrected and minor changes made. There may be additional back-and-forth and fine-tuning in layout and design that doesn't involve the author. For some books, uncorrected page proofs, galleys or ARCs of the book may be printed and bound for advance book marketing and publicity purposes. During the printing and shipping - the final stages of production - there's usually a lull in activity for the author. Once the pages are final, an index is created, typeset, and proofread. (Note: the author generally pays for the indexing; this is outlined in the book contract and the money is deducted from the advance against royalties). The files are now reviewed for any issues and prepped for manufacturing. Copies of the final, clean files (including artwork) are simultaneously sent to the printer for printing and binding, and to a file converter (either in-house or freelance) who preps the files for the e-book version. 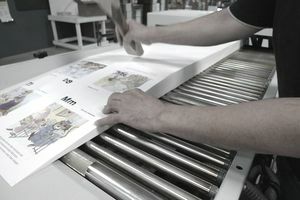 Books come off the press and advance copies are rushed to the publisher. Samples are distributed to the author, the editor and the agent, but the bulk is generally used for publicity mailings to media and for the sales departments to give to accounts. The books are packed and shipped to the publisher's warehouse. The length of time for printing and shipping varies dramatically--from 3 weeks turnaround for an all-text computer book printed in the U.S. to months for printing overseas (which is the norm for most full-color books) and being shipped back via boat, going through customs, and trucked to the publisher's warehouse. Finished books ship from warehouse to retail destinations, such as individual independent bookstores or national account distribution centers (such as for Barnes & Noble or Amazon.com) where they are inventoried, unpacked, re-shipped (in the case of distribution centers) and shelved for consumer purchase in time for the on-sale date. In a parallel timeframe to printing and shipping, properly coded e-book files are made available to the online retailers via data feeds from the publisher. The bookseller offers them for purchase and download by consumers through their websites.